Tom Shahan, CCVGovernor Scott held a November 14th press conference at CCV-Montpelier to discuss apprenticeship programs. 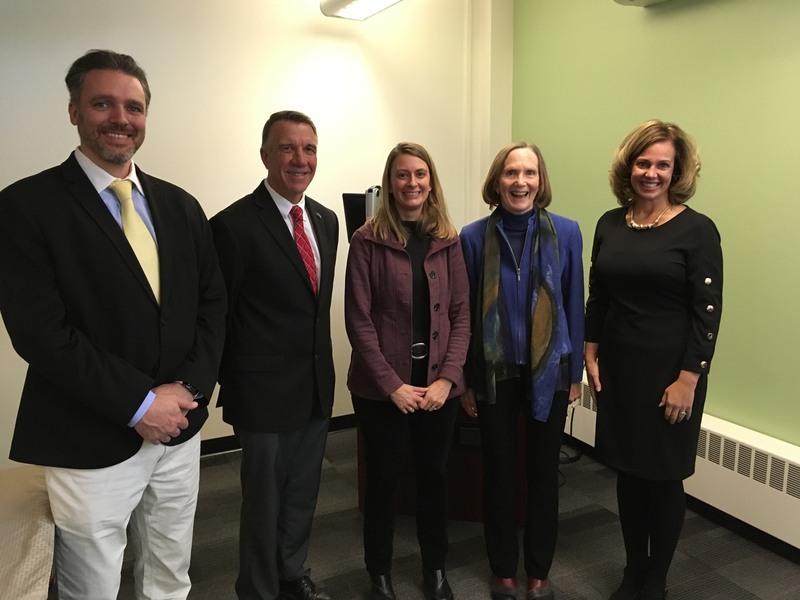 He was joined by CCV’s business and outreach manager Mike Keogh, CCV’s associate dean of workforce education Tiffany Keune, CCV president Joyce Judy, and Vermont Department of Labor commissioner Lindsay Kurrle. As fall semester begins to wind down, we’re celebrating the recent accomplishments of students, faculty, and staff from around the state. Happy reading, and don’t forget to share your own news by emailing marketing@ccv.edu! Coordinator of academic services Phil Crossman facilitated a discussion about Basma Abdel Aziz’s novel The Queue at the Fletcher Free Library on November 28th. The book, published in 2016, was winner of the English PEN Translation Award. Student Phaewryn J.D. O’Guin received the 2018 Undergraduate of the Year award from the Institute of Electrical and Electronics Engineers’ (IEEE) Green Mountain Section at their annual award ceremony. The award recognizes outstanding performance in undergraduate studies and volunteerism in social media for IEEE’s Green Mountain section. O’Guin is pursuing degrees in Information Technology and STEM studies. Issue 4 of faculty member Kathryn Merriam’s peer-reviewed academic journal, Iroquoia: the Journal of the Conference on Iroquois Research came out in October. Merriam is editor of the journal, which is distributed annually at the Conference on Iroquois Research. Merriam teaches Native American Histories and Cultures online. Faculty member Lisa Guerrero presented at the National Association for the Education of Young Children (NAEYC) annual conference in Washington, D.C., where she facilitated a workshop entitled “The Empowerment Project: Early Childhood Professionals as Agents of Change.” The presentation is a sneak peek at a longer series Guerrero has been sharing throughout Vermont in an effort to engage early childhood professionals in the creation of positive social change. Associate dean of workforce education Tiffany Keune has been appointed to the Board of Girls on the Run Vermont. The statewide organization integrates running, stretching, and strengthening into its mission of inspiring girls to be joyful, confident, and healthy. Keune has served as a coach and volunteer for Girls on the Run Vermont. Faculty member Gilberto Diaz Santos was a keynote speaker at the 14th Annual Miami Dade TESOL Symposium held at Miami Sunset Senior High on October 26th. His presentation, “Integrating Language and Content: A FASP-Based Model,” examined how contemporary fictional representations of professional/occupational practices (in film, TV and literature) can successfully promote acquiring or building up knowledge of school subjects, critical thinking skills, media literacy, and both autonomy and collaboration among a wide population of English language learners. Santos teaches English for Academic Purposes in Winooski. Winooski coordinator of academic services Dave Amsden participated in a Vermont Edition conversation on Vermont Public Radio on November 14th. Amsden joined host Ric Cengeri to talk about what cultivating and supporting a diverse student body looks like at CCV. CCV-Newport’s annual “Haunted Hallways” Halloween event drew more than 800 guests from around the community. Several area agencies joined up with CCV to hand out candy and other swag to trick-or-treaters. CCV-Montpelier hosted Governor Phil Scott and representatives from the Vermont Department of Labor, Vermont Technical College, Vermont Works for Women, DealerPolicy, and Cota & Cota for a November 14 press conference to discuss the expansion of local apprenticeship opportunities and proclaim November 12 – 19 National Apprenticeship Week in Vermont. CCV’s Veterans Services team sponsored and hosted Veterans Town Hall events in Burlington and Rutland on November 4th. The town halls were organized to provide a space for veterans to share their experiences with the civilian community.